Update: 4 LFS Novas Out of Service out back: 9907, 9910, 9939-9940. Strange thing is that 9907 + 9910 had disappeared for 10 days but have reappeared. Have not seen 9913 + 9917 in service for almost 10 days but they are not out back. Hello Everyone: Update: 9939-9940 have been removed from the Out of Service area, not sure where they went but thankfully they are not in the scrap yard adjacent to the garage. 9907 & 9910 are the only two left. CDTA/NX # 317 has joined them back there. 2019 Updates: 4143 is in Schenectady while 4021H has taken up residence in Albany. Looks like 9913 is the last one standing. Three Novas out back are: 9907, 9910 + 99?? (I believe it's 9917, the number is not visible). 2019 Update: Looks like 4008H - 4025H have taken up residence in Albany Garage. Not sure what was traded for but 4143 is in Schenectady and have not seen 4135 - 4147 in Albany. Some units are getting new front numbers in a larger sized font. Local Buses are using white numbers while the limiteds are using black numbers. Wonder what the next new stuff will be ? New Gillig batch delivery looks to be underway. Unsure of the full delivery numbers yet. 4183 was on the 214 yesterday and 4185 was on the 12 today. AFAIK those are the only two out on the road so far. Neither of them have permanent plates, only paper tags. Some interesting changes for the new 2019s. The seat design is different now with an all blue woven nylon texture as well as a completely new automatic annunciator voice. It's now a Male voice that sounds very robotic. Sounds fairly reminiscent to the "Stand clear of the closing doors please" guy on the MTA subways. IMHO I'm not a massive fan of the new voice. Hello Again : GilliGillig 4191 in service on the 6 Route. 4193 In Service with temporary plates. 4186 In Service with permanent plates. This batch also has LED hyperwhite headlights, very bright even in daytime with the sun shinning. 4195 in Service, Guess this order is for more then 12 units. Also, as for the retired LFS Novas Out back, it's down to 2, 9910 + 9907, which has it's engine hatch door open. No idea where 9917 disappeared to. 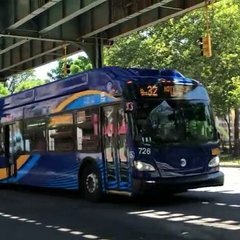 CDTA is one of the few transit authorities that did not go with RTS. They stayed away from them. The order was for 12 buses 4183 to 4194 . All 12 delivered. There is no bus with the number 4195 , There is a 4095 in service. I am aware of what they were supposed to receive. I am almost positive that I saw a new Gillig numbered 4195. I will keep my eyes open for it. It appears as if there has been some equipment shifts between Albany Garage and Schenectady Garage and Troy. 4128 + 4150 have taken up residence in Schenectady while Albany seems to have more of the 4026H - 4031H Group. I will post the moves as I see them. 4140 has taken up residence in Schenectady. Update : Albany now has 4008 up to 4053H. Just saw 4160 on the 22 Route, so I guess 4160 is now a Troy Bus.